If your computer is used by multiple users, then there will definitely be files you fear will get accessed some other user. The only way to protect your data is file encryption. I’ve tried a fair share of encryption programs. Some of them offer little functionality while others are just too complicated to use for the average computer user. Conceal finds a perfect balance between these two boundaries. Conceal realizes that if you encrypt a lot of files while choosing different passwords, it can become quite hard to keep track of the passwords. The solution the program provides it perfect: it can save your passwords! 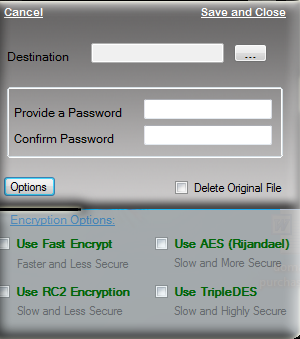 While encrypting a file, you can assign the encrypted file a location as well as where the password should be saved. Conceal provides a wonderfully simple encryption technique to everyday computer users; it deserves two thumbs up!